In spring, Victoria, B.C. is one of the best bets in our corner of the continent for low-stress recreation, offering plentiful and easily accessible cafes, shops, museums and bars. VICTORIA, B.C. — In spring, the best bets in our corner of the continent for low-stress recreation offer plentiful and easily accessible cafes, shops, museums and bars to pop into in case a downpour starts. Perhaps better than any other city in the region, Victoria fits that bill. Few cities have as much recreation so close to the center of the cultural action. Walking trails spread out from downtown, lining almost every stretch of the undulating shoreline. Cyclists hit innumerable bike-friendly trails, including the famous Galloping Goose. Water lovers go for kayak paddles in the protected harbor. My husband, Bill, and I visited Victoria on a recent weekend. It’s a good thing recreation was on the agenda, because we had a lot of calories to burn. You have to exercise to justify eating the yummy treats all over town. The famous afternoon tea at the Fairmont Empress hotel is just the start. If only the favorable exchange rate applied to calories. We started our trip with a “Discover the Past” walking tour of historical areas, of which there are many. It turned out to be a great introduction to British Columbia’s capital. Our guide, Chris Adams (son of company founder John Adams), started with native people who made this area their home before British traders from the Hudson’s Bay Company arrived in the 1840s and filled in a century’s worth of vice, virtue and social change. “The stories of Victoria link this city to the other exciting places in the world, especially in the 19th century,” Adams said. In many ways, the history of Victoria tells the story of the British Empire, from exploration to colonization to nostalgia for earlier greatness. That British heritage is apparent everywhere, in English-style pubs, teahouses and gardens. When train routes were punched through to Vancouver, Victoria took second place among B.C.’s important cities. This ultimately preserved many streets, pedestrian walkways and alleys and helped make Victoria one of the West Coast’s most walkable cities. Plaques, sculptures and historic markers line many of the streets and sidewalks around town, many of them pointing to the area’s native heritage. We stayed at the Parkside Hotel & Spa, largely because it’s right near Beacon Hill Park, one of the largest parks in Victoria and one of the best places to take a wander without roaming too far from the city center. 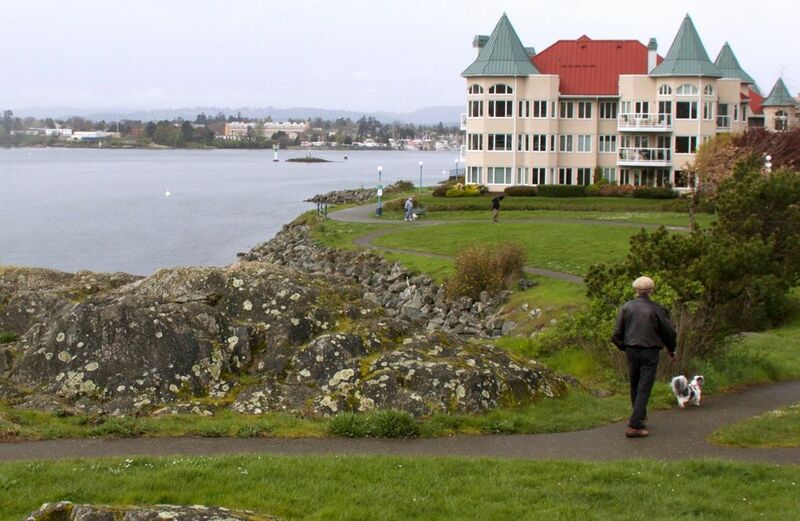 Victoria is nicknamed “Garden City,” and Beacon Hill Park is one reason why. The park’s many paths lead past manicured flower beds, lily-pad-adorned ponds and children’s play areas. People play miniature golf and cricket here on sunny days. It was raining when we discovered the giant watering-can sculpture in the middle of the park and laughed as we stood in the dry spot under its wide, round spout while water poured down around us. On the park’s south end, a field full of purple camas flowers (a staple of the native peoples’ diet) led to a blustery headland overlooking the Strait of Juan de Fuca. The park also provides one of the many access points for Dallas Road, which wanders along the southern coast for miles. An accompanying walking and cycle path branches away from the roadway through undeveloped beachy areas from Holland Point Park to Clover Point Park. From here, you can look across the strait to the Olympic Peninsula, watch giant ships go by and check out what’s said to be the world’s tallest totem pole. interpretive signs. Plan to stop for lunch on the deck at Spinnakers Gastro Brewpub and Guesthouse, reputed to be Canada’s oldest brew pub. You can bring a bicycle on the Victoria Clipper (there’s a $20 added fee each way), but it’s just as easy (and, depending on the rental period, less expensive) to rent bicycles in Victoria. We stopped in at Cycle B.C., which also rents scooters and motorcycles, at 685 Humboldt St. Bike-rental places are good starting points for advice on where to go. Be sure to bring a good map, especially if your phone doesn’t have a Canadian data plan. 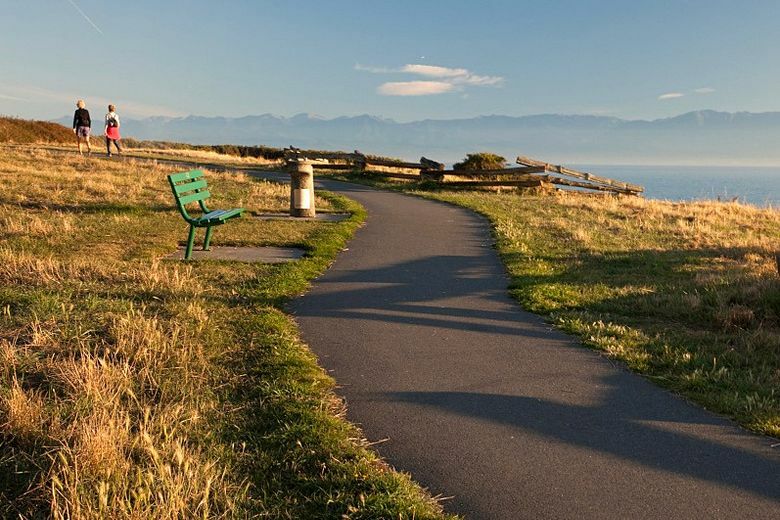 The Galloping Goose Regional Trail is a 37-mile-long multiuse route from Victoria to Sooke Provincial Park, to the west. The first 10 miles or so are some of the easiest, while the parts closer to Sooke are less crowded. The Galloping Goose curves past the harbor and through a canopy of trees to a series of lakes. Cyclists can also bring their bikes on a BC Transit bus to starting points farther west. The route’s railroad-bed origin means gentle slopes along its pavement and gravel surfaces. A locally beloved organic bakery, Fol Epi, is conveniently right near where the path starts in Victoria. There, you can grab snacks or sandwiches for a picnic lunch to Thetis Lake Regional Park, 7 miles to the west. Bicycling is also a great way to get around the greater Victoria area, perhaps to visit more parks and gardens and find even more places for tea and baked goods — as if you needed any. From Seattle, Victoria is a 2-hour, 45-minute ride on the Victoria Clipper (clippervacations.com) or a 45-minute floatplane trip on Kenmore Air (kenmoreair.com). 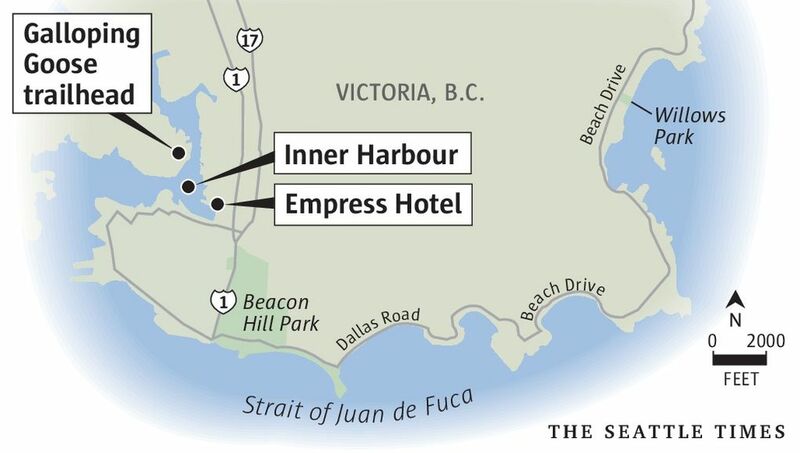 • For general information about Victoria, including events, lodging, and attractions: tourismvictoria.com. • Discover the Past walking tours ($8-$15): discoverthepast.com.